Game over, Heavy Texters! From tomorrow [27th September, 2011] you will lose your ‘Freedom to Text’. If you are caught unaware, go read this first. We don’t welcome this move by TRAI. Imposing restrictions on normal users is not fair at all, considering the fact that most of the normal user doesn’t indulge in sending commercial SMSes. If anything TRAI wants to do to stop the Unwanted SMS Menace, it should make tough regulations and impose heavy fines on the ones who indulge in sending commercial SMSes without adhering to the rules and regulations of TRAI in this regard, instead of imposing 100 SMS per day per SIM ‘PENATLY’ on the normal users. 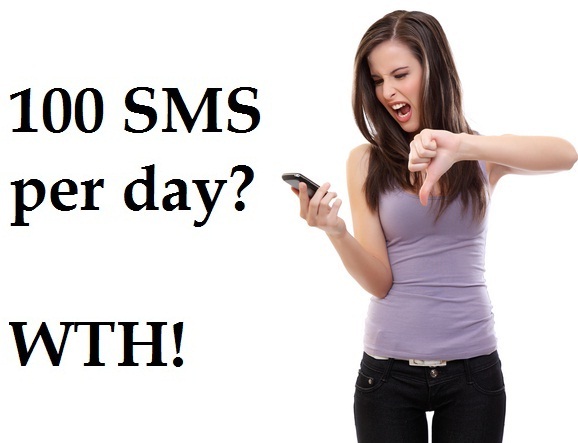 According the new regulations “no Access Provider shall permit sending of more than one hundred SMS per day per SIM”. Earlier some of the telecom operators imposed this restriction and used to charge the users once they crossed the 100 SMS limit. But from the recent amendment in the regulation we assume that you won’t be allowed to send more than 100 SMSes. Just think of this, what if somebody wants to send a emergency text to his/her friends or family, at that time one can bang his head on the wall for sending more than 100 SMSes on that day. Restricting users like this is insane, really! What are the alternatives then, you ask? Buy a few Dual SIM phones and a few SIM cards, not practical for all, we know. Well, what you can do is buy a smartphone or a phone which allows you to connect to the internet. You can download mobile messaging apps like Whatsapp, Nimbuzz, Viber etc for sending ‘forwards’. For chatting you may try out gtalk app or any other mobile messaging app. For now, it appears, this is the only solution. Just hope that TRAI come up with something better and lift the restriction. Will this restriction result into any revenue loss? We don’t think so. On the other hand, telecom operators might see a slight increase in their revenues. We expect, that telecom operators won’t change the rates of their SMS packs, but will reduce the number of SMSes due to this regulation. Also, if more and more users will start using mobile messaging apps, then it will result in increase in GPRS Packs consumption, thereby increase in the revenue. We would love to know what you have to say on this. Do share your views.